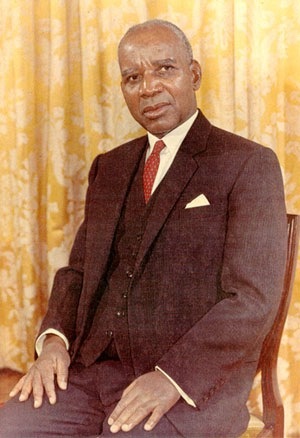 Hastings Banda, the first president of Malawi, was initially presented to the Malawi people by British Colonial officials as the best person who could lead them into independence. Later as the country’s self-declared “life president,” Banda transformed this African democracy into a repressive dictatorship that spanned three decades. The regime eventually succumbed to international pressure for political reform, forcing Banda out of the presidency at the age of 98. Banda was born about 1896 near Mthunthama, Kasungu, a province in the southeast African British colony of Nyasaland. At the age of 20 he moved to South Africa where he planned to attend Lovedale College. Instead, he spent the next 10 years working at the Witwatersrand deep mine in Boksburg. In 1922 Banda joined the African Methodist Episcopal (AME) Church and a year later met American Bishop William T. Vernon, who would sponsor Banda’s travel to the United States to study. Banda arrived in the United States in 1925 and enrolled in AME Church’s Wilberforce Institute in Ohio, where he graduated in three years. Banda then earned a medical degree, continuing his studies in 1938 at the School of Medicine of the Royal College of Physicians and Surgeons in Edinburgh, Scotland. After World War II, Banda established a successful practice in London. Active in the Pan-African movement, Banda acted as an overseas advisor when the Nyasaland African Congress (NAC) formed in 1944, and in 1953 he left London to establish a medical practice in West African Ghana. After five years there he returned to Nyasaland when the NAC convinced him to lead the fight for decolonization. Riots and other challenges to British rule in early 1959 led to the banning of the NAC, and Banda and many other Congress members were imprisoned. After a year, Banda was released and took over the Malawi Congress Party (MCP), formed to replace the NAC. On July 6, 1964, Nyasaland became independent and was renamed Malawi with Banda as its first head of state. Within two months, Banda outlawed all other political parties and transformed the democracy into a one-party dictatorship. He declared himself life president in 1971. Banda was an absolute ruler. Anyone refusing to join the MCP faced violent persecution. Banda held power for two decades until international aid groups forced political reform, including elections. In the parliamentary elections of 1994 the MCP lost its control and Banda was replaced by Bakili Muluzi, head of the United Democratic Front. Dr. Hastings Banda died on November 25, 1997, in South Africa. Kevin Shillington, Encyclopedia of African History (New York: Fitzroy Dearborn, 2005); Marshall Cavendish Corporation, Peoples of Africa (New York: Marshall Cavendish, 2001); http://www.answers.com/topic/hastings-kamuzu-banda.